Evidently, “social news network” Rappler can dish it out but cannot take it. After a journalistic fiasco that laid bare the abject sloppy journalism of its “reporter” Carmela Fonbuena the girls of Rappler led by top Rapplerettes Pia Ranada and Natashya Gutierrez have banded together in a big “girl power” online powow to get behind their embattled colleague. In a mid-January “investigative report” Fonbuena alleged that Special Assistant to the President Christopher “Bong” Go “intervened” in an on-going project involving the acquisition of two brand-new warships from Korean shipbuilder Hyundai Heavy Industries. The report got Rappler and the Inquirer (which also ran a story on the topic that also mentioned Go) in the crosshairs of a Senate probe on the deal. During the probe, accusations of “fake news” were thrown at the two news media firms. The Inquirer has since released a statement defending its reports by citing evidence that it remained focused on facts and maintained balance in its reporting. It bothers us how public officials resort to branding as “fake news” legitimate, verified, and vetted news stories when they refuse to explain or address unpleasant facts presented to them. Is “fake news” the new defense of public officials against public scrutiny? 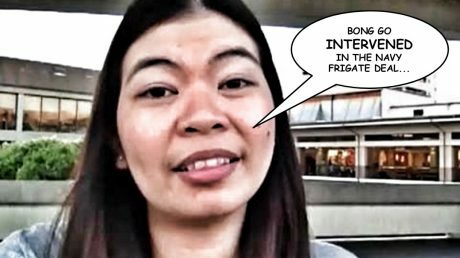 This and everything else written in the Rappler statement neither addresses nor clarifies Fonbuena’s use of the word “intervened” in her report to describe Go’s involvement in the brouhaha — a word that does not appear in any of the Inquirer reports to refer to Go’s inclusion as a person of interest. It is interesting the way Rappler would put up a strawman to divert attention from the core fact of Fonbuena’s unethical journalism. Interesting, because it is consistent with the way its CEO Maria Ressa sneakily made an issue that was about her company’s violation of regulation applicable to media businesses into one about “press freedom” a while back. It’s a hard habit to break, evidently. Previous Article Bong Go cleared of “intervention” allegations, Rappler’s crooked journalism laid bare! The mainstream media in general tend to use plausible deniability as a defense in their irresponsible reporting, as what happened to the Rappler report that inevitably implicated Bong Go to the frigate issue. There was malice in the report. Let’s not kid each other. That’s what’s annoying with the Philippine MSM. It is indeed intellectual dishonesty on the MSM’s part that makes people lose trust in them. One example is a question from the MPC to Roque about foreign intelligence sharing with the President. That media personnel asked if it was really appropriate to incude intel on the Opposition. As if the Opposition doesn’t have the means to spy on Duterte. I mean come on. That’s the level of wit that creates their reporting. It’s time for Filipinos to step up and work towards our advantage. Add to this the Resorts World attack being blamed on ISIS. Quite the rumor monger. Rappler snd Inquirer, are both the sources of Fake News, and “Destroy Duterte media” in our country. These so called media people, are pretending to be Investigative Journalists. In truth, they are not. They are there to destroy the agenda and programs of Pres. Duterte. They overlook the massive corruption of the previous Aquino administration. If they are true as Invesigative Journalists; they should look at the : DAP, PDAF, missing Typhoon Yolanda Fund, Dengvaxia vaccine scandal, the selling of Scarborough Shoals and other islands by Trillanes and Aquino, etc. Mainstream media like Rappler, Inquirer, ABS-CBN, etc… are not to be trusted. How to catch a crook? Ask her/him if she/he knows anybody strait.